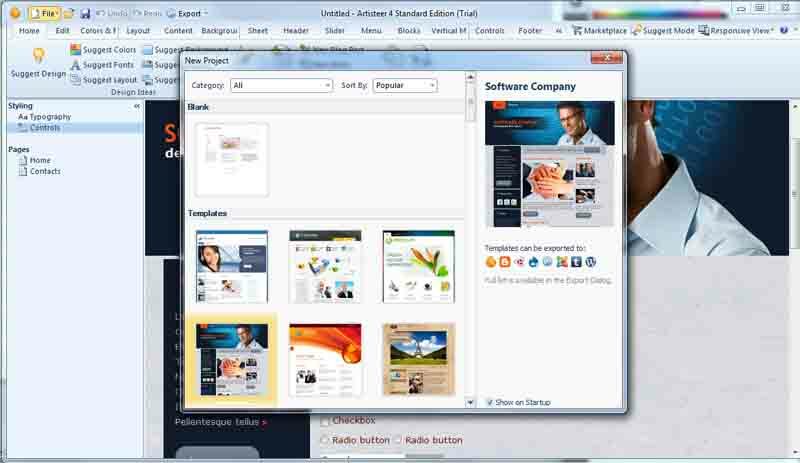 Artisteer website builder is an excellent low cost tool that allows you to quickly create a website. Their website shows a Mac version is on the way and a Linux version is down the road but at the time of this article only the Windows PC version is available. Artisteer is more geared to the professional designer and comes in two versions - Standard ( $129.95 ) and Home edition ( $49.95 ). For a user that wants a simple to use WYSIWYG design software this one does fill the bill. The Home Edition comes with many templates and art work to make designing your site very easy. Unlike other design tools which has a fixed number of templates this one builds templates by use of a suggest button. The suggest feature also can alter the template you picked to change any part of it such as menu position, background images / patterns and more. I found it no harder than using MS Word to work on a design and I think you too will find it easy to use. For a user that wants a simple to use WYSIWYG design software this one does fill the bill and it has all the bells and whistles that one would desire. When you have your design completed you can publish it or export it to HTML, Blogger Template or Wordpress Theme. Now this is realy a neat feature as for many that would like to use Wordpress but may find it hard to find a template that fits and may find it harder to make the template look the way you want even if you did find one you like. Here all you do is design your website on your own PC and when done export or publish it. The Standard Version is basicly the same as the Home version except it can not only export as a Blogger Template or Wordpress Theme it can do more. The Standard Version can also export as a Joomla, Drupal or DotNetNuke template! In addition there are plug-ins available to export to others and it comes with a Library of Textures, Glares and Gradients plus more. It has a good clean design and even a novice will find it not hard to use. It does not have a drag and drop object type of design which is popular today as it's more a basic editor. The the default creates a Responsive design but can be set to fixed size. The HTML produced is very good as I do not see anything that profesionals may complain about. It has excellent FTP support as you can set port selection, secure or non secure and SCP connections. On the downside it does not allow you to open a Template or HTML file that you may have purchased. Be sure to turn off suggest mode when you no longer want to use it else things you click on will change to a new suggested design. The import is limited to Artisteer file types only. There is no way to edit / view the whole page HTML as source. You can right click and edit a small section which opens a plain text window with two check boxes. One is for word wrap ( on or off) and the other is edit whole article. When edit whole article is checked everything in a column is brought into the plain text editor and a message which states warning after saving everything will be combined into one cell. You can edit the HTML or CSS when done with the design when you export it as the HTML code is clean and easy to read. There is no application help as clicking on help sends you to a PDF document on their website. This needs to be addressed as it took me quite some time to find out you can't import html files. Overall I find it an excellent choice for anyone that is looking for an easy to use tool for website design and the added feature of being able to export the design to a template for Wordpress, Joomla or any of the others is a big plus. Low cost quick Website builder for Windows users. The 90 second Website builder is a good solution for those that want a low cost alternative to creating a website. 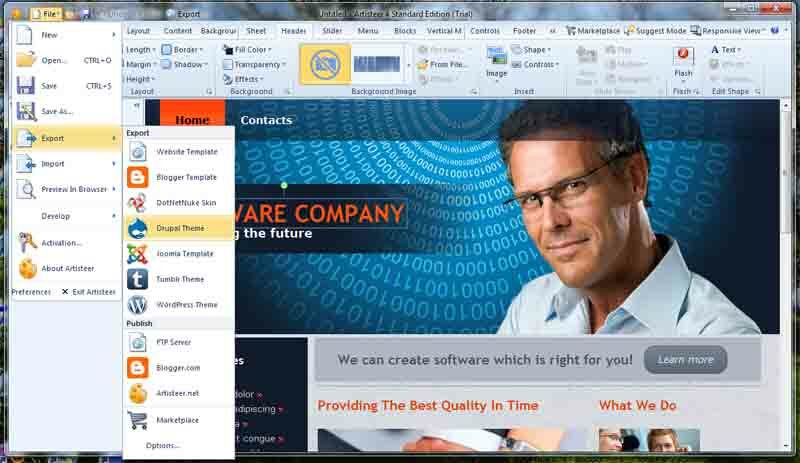 Unlike other tools out there such as Dreamweaver or Expression this tool is very easy to use. Microsoft has abandoned Expression but still has it available to install and use for free. Expression is a powerful website designer but it is not for someone that is looking for something they can quickly jump into and turn out a website in a short time period. But if you are an very advanced user and have good knowledge of HTML syntax then you can't beat free and Expression is a good tool. With the 90 second Website builder you just pick a template from the many templates given or quickly design your own and you will have a website in one or two days. It in fact works very similar to Website builders such a Wix or Webs but with the 90 second website builder you avoid the high monthly cost of such online diy services. With a low onetime cost of under $50 this has all other ways of diy beat. You can start off with a blank page and let your imagination go from there or you can use the import feature to bring in any template or webpage. They also offer for $20 more access to their complete template and graphic library which is a low cost should you want to get by on a small budget. With a domain names as low as $9.99 per year and hosting as low as $24.95 per year your total cost can be under $100 to setup your website. From the early version of this application which had less features to version 10 which has so many features it comes close to competing with much more expensive versions of software builders. 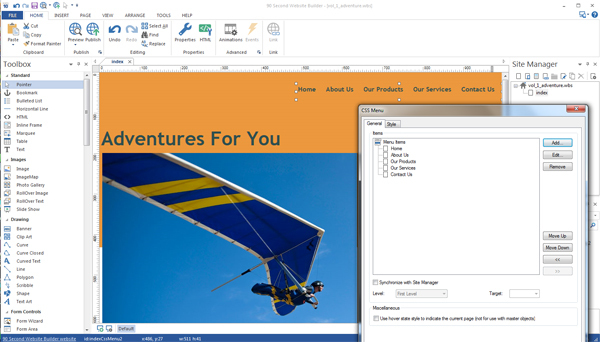 Features such as Image Galleries, Sliders, Videos, sounds and more can be placed on a page by just clicking on the selected item and then point and click with your mouse dragging it as to create a box to the required size needed. To edit text or anything placed on a page you just double click it and a pop up response window will display all the settings you can alter. The company has managed to add all the needed features to the product so as to be up on the latest trends of web design. From support for HTML5, animation, responsive design and mobile devices such as iPhone or tablets this software covers it all. On the downside the program saves projects in a single file which if you are a bit more advanced and like to edit the HTML you will not be able to edit anything saved by the builder. You can although edit the HTML using the editor in the builder. There are many free templates you can download but adding them to the application is not easy. I found that it was easier to copy the contents of the zip files which contained many templates to the folder \Documents\90 Second Website Builder\system\templates was much easier than using the built-in template install feature. Another problem is it saves everything in div containers so each line of text is in a div. This makes it hard to edit a page for a user that is somewhat experienced with HTML code. Last the support for FTP is lacking secure FTP connections ( SSL ). With security becoming more important by many hosting companies the trend is moving towards many hosts only supporting secure connections which can make uploading a finished website a bit of a problem with this product. Although the average website designer will not like the looks of the code the application creates the resulting pages are quite good. Also since search engines don't care about such things you needn’t worry about it effecting your search ranking. In closing I think if you ever used FrontPage and want to find a good replacement you may find this to be a perfect replacement. Based on the final results and the low cost I find this an excellent tool for those that want a website but don't want to pay the high cost of a custom design or the high monthly cost of website services such as Wix, Webs and others.